This site is dedicated to a moral principle, which I call the Principle of Goodness, and as such I have largely refrained from direct political comments. But world conditions have so worsened since this site was first created that I think this policy must change. One of the things I warned of back in 2010 was the danger of descent of our entire civilisation into a new dark age. Now, many commentators are coming to the same conclusion. I warned of how leftism, political correctness, neo-marxism, call it what you will, is actually a religion, and a false one at that. And I specifically added that the global warming cult is not science, it is just one more branch of bad religion. Once more, many others have added their voice to the same opinion. So, it is certainly time that I directly applied the Principle of Goodness to these situations, not only to illustrate the Principle, but also in the hope of changing the bad situation. And solar thermal is one of the very worst. I write to you today in your capacity as Premier of South Australia, and in light of your announcement to build a massive solar thermal power plant in your state. Now I do not know whether you are a "typical politician", whose only interest is to count "for" and "against" voters, or whether you genuinely care and will change your views depending on evidence and ethics. If the former, count me as "against", but note that I live in Queensland and, therefore, stop reading. But I assume you are the latter, and so I write on. I do not know whether you are aware that these plants are bird-killers. Not only that, but they are bird-torturers. Any bird that flies into the path of the beam (which is huge) is instantly blinded, then its feathers catch fire and its skin is burned off. It is likely that it then falls out of the path of the beam onto the ground, in writhing agony but still alive, to slowly die in excruciating pain over several hours. This fact alone should rule out ever creating one of these evil monstrosities. It is my overriding reason to implore you to alter your path now, do not commit the obscene evil of constructing one of these industrial-scale torture plants, before your name goes down in history, to be reviled as one of the worst of humanity, by a better and kinder age than ours, which we all must surely hope will arise in future centuries. Although that is my overriding reason for this letter, there are some other reasons persuasive in themselves, so I give them now. Firstly, these plants have terrible efficiencies and will result in even dearer power than your already worst in the world prices. You cannot build a cheap system out of expensive components. And, of course, like all solar plants, they only work when the sun is up and the clouds are on holiday. You cannot get a reliable system by adding even more unreliable components. But lastly, I mention what I assume is your reason in the first place for taking all these steps, so consistently over more than a decade, of eliminating coal power: you believe in the alarmist global warming theory. Regarding this, I had no opinion prior to 2008, when I investigated the science for myself. As a physicist, I am fully competent to do exactly that. It was trivially easy to discover that this theory is wrong, so wrong in fact, that I find it difficult to believe that any other equally qualified person who advocates it after investigating it for themselves is being other than dishonest. On this topic, you don't get to have an opinion. By "opinion", I mean the sort of belief we have about the merits of home schooling, or gay marriage, or the correct rate of taxation. On all social issues, there is ultimately only a judgement call. But on a scientific issue like global warming, you either believe the truth, or you don't. Perhaps the truth isn't yet clear (although I think it is very clear), but, sooner or later, nature will prove who is right and who is wrong. I shall briefly tell you why nature will prove you wrong. The impression is very cleverly nurtured that warming skeptics don't believe that carbon dioxide causes warming. That is false. All credible skeptics believe that carbon dioxide causes warming, typically some figure around 1 degree C per doubling of CO2. And all warmist scientists believe exactly the same thing! The dispute is over whether this 1C figure is multiplied many times over by the effect of water vapour, the idea being that the small warming due to CO2 causes extra evaporation of water from the oceans and, water being the most powerful greenhouse gas, this water doubles, quadruples, or worse, the effect of the carbon dioxide. But if that is true, there must be rising water vapour levels over the tropical oceans, and the heating must be in that same place, leading to preferential warming, or a "tropospheric hotspot". In science, you test a theory's predictions; if they do not accord with the facts, the theory is wrong. This hotspot predicted by the alarmist theory does not exist, therefore the theory is wrong. But also, that extra water vapour should be there in the upper troposphere. Water content has decreased. The theory is therefore proved wrong a second time. And the net effect of all this greenhouse gas should reduce radiation to space. Radiation has increased. That is the third conclusive disproof of the alarmist global warming theory. 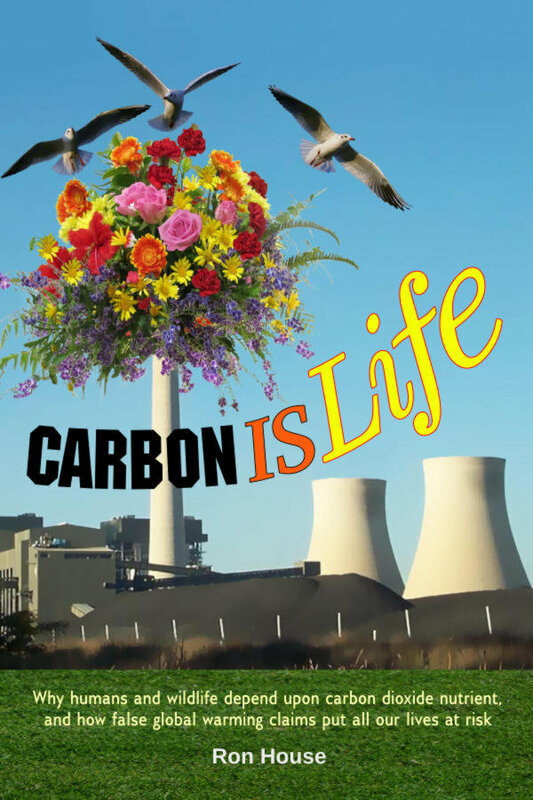 Everyone believes the modest "straight" heating effect of carbon dioxide. The alarmist theory, that water vapour turns this modest and beneficial heating into dangerous runaway heating, has been proven false at least three times over. Add to that the fact that, during the current cycle of glaciations that started over two million years ago, CO2 concentration has always trailed temperature and has never led it, and it is clear that carbon dioxide cannot be the driver of world temperature. But there is yet another fact that disproves the alarmist theory: we exist! Our planet is some four-odd billion years old. It has been scorched by the heat of nearby supernovae; it has been hit by meteorites, large and small; it has been ravaged by super volcanoes, which cover half a continent in lava; carbon dioxide levels have been twenty times what they are today. At times even the water in the oceans was at temperatures somewhere near 40C! And yet, in all this, the planet has never had the runaway heating the alarmist warn us about, supposedly caused by human emissions a mere 3% of natural emissions of carbon dioxide. The planetary climate system simply cannot be unstable as the alarmists claim; if so, it would have happened already. Finally, the Commonwealth's own chief scientist has admitted that, even if all the alarmist theories are correct, closing down the entire Australian economy would make virtually no difference to global temperatures. https://judithcurry.com, which is a site run by a climate scientist which tries to summarise and abalyse the evidence. https://wattsupwiththat.com, a site run by an AMS-certified former television meteorologist, tries to report relevant news and scientific papers; although a skeptical site, alarmist papers are also reported. http://joannenova.com.au, an Australian site by an active wife and husband team, one of whom is a fully qualified physicist. My own site, http://peacelegacy.org, not specifically devoted to global warming, although by happenstance, much of the content concerns this issue. Two things, of course, might stop you proceeding to question your received assumptions. You are a busy man, and learning the truth of your own knowledge, rather than just accepting what your political allies believe, takes time and effort. And, of course, it also takes courage. At the risk of being impolite, I finally add that I am not interested in a "politician's" reply to this letter: I could write it myself without much effort. If you wish to respond as a caring human being, I wish you the very best results in your search for the truth, and I shall keenly await your reply. End of open letter to Jay Weatherill.